The storm's sustained winds reached 121 km/h, just over the threshold for a hurricane, on Sunday morning as it was moving across the Atlantic, about 1,200 kilometres southeast of Bermuda. It was heading west at nine km/h. The National Hurricane Center says Florence could make landfall by Friday in the southeast U.S. and that residents from South Carolina to the mid-Atlantic need to get ready. 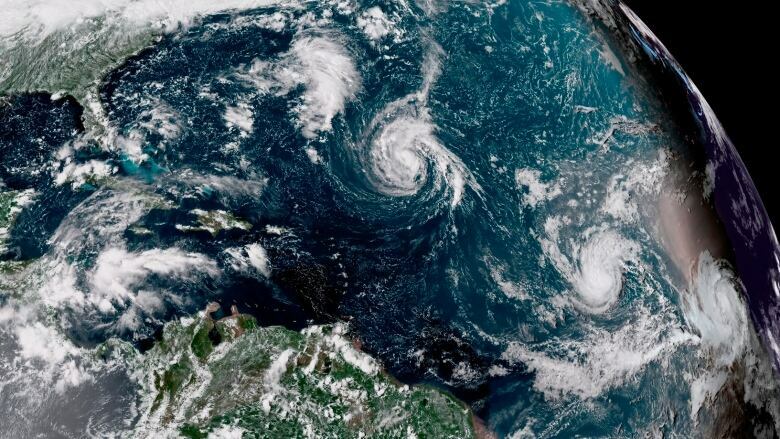 The centre said Florence had re-strengthened into a Category 1 hurricane Sunday as it was located about 1,100 kilometres southeast of Bermuda. Forecasters predicted it would become a dangerous Category 4 storm before a possible landfall Friday. South Carolina's governor says residents should count on "a lot of wind and a lot of rain" from Hurricane Florence this week. Gov. Henry McMaster told a news conference Sunday that people should "pretend, assume, presume that a major hurricane is going to hit right smack dab in the middle of South Carolina and is going to go way inshore." McMaster and the governor of Virginia have declared states of emergency to give them time to prepare, and the U.S. Navy said ships in Virginia's Hampton Roads area would leave port for their own safety. Norwegian Dawn, scheduled to depart from Boston on September 7, will not sail her original itinerary due to the anticipated weather conditions in Bermuda. She will instead call in Halifax and Sydney, Nova Scotia; St. John, New Brunswick; and Bar Harbor, Maine. In South Carolina, Charleston city officials were offering sandbags for residents to fill. Meanwhile, Myrtle Beach Mayor Brenda Bethune urged residents to secure their homes, but said it's too early to know if evacuations will be ordered. Norwegian Cruise Line said it had to change the itinerary of a Bermuda-bound ship — adding stops in the Maritimes — because of the storm. The vessel departed Boston on Friday, but instead of heading south it arrived in Halifax on Sunday morning. The company said it will depart for Sydney, N.S., on Sunday night before heading to Saint John and Bar Harbor, Maine, on its way back to Boston. Carnival Cruise Line said Sunday that it had also changed the schedule of its cruise ships to accommodate tropical weather threats. The storm had been downgraded from a hurricane to a tropical storm last week before it began to strengthen again over the Atlantic late Friday. Dangerous swells generated by Florence were expected to batter Bermuda early in the week, as well as parts of the U.S. Eastern Seaboard. The National Weather Center has also warned of dangerous rip currents in popular tourist areas like Virginia Beach and the Outer Banks. Advisories warning of dangerous beach conditions or coastal flooding were in effect for parts of New Jersey, Delaware, Virginia, North Carolina, South Carolina, Georgia, and Florida.